This angry smiley is about to pound its fist to make its point. 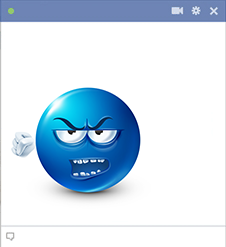 When you're discussing a topic on Facebook, you can share this smiley to emphasize your point. With its bright blue face and attention-getting expression, it's sure to captivate your acquaintance. You'll discover we have many eye-catching images on our database.